Pens from 24p when you buy 1000. 400ml plastic double walled solid coloured travel mug with handle, screw on lid and matching coloured sip cover. Available in 12 Fantastic Colours! We are a full service promotional product company based in the heart of the UK, and offer up to 50,000+ high quality printed items at very competitive prices. If you can't find the product or item that you are looking for on our website please don't hesitate to call one of our dedicated sales team. They will be happy to give you advice and information on any of the products on our site as well as others that are not. If you have a specific promotional product in mind, we can normally source the product be it from the UK or overseas. The only limitation is your imagination. Our full service includes free design with every product, our professional design team will work closely with you to get the best out of any products that you may purchase from our company. We will always send you design sign off sheets before any item goes into production. Our design team is highly experienced and is able to turn around your artwork quickly and consistently. This way your order is turned around to meet all the deadlines you set with time to spare. Talk to our experienced staff. They can help you find the right promotional product for your campaign. Our in-house designers will convert your ideas into reality. We can convert your images to print ready files all for Free, when you place an order. We offer quick quoting through our website as well as live pricing. If you are in a rush we can help! As well as being quick we offer best value prices. When we quote a price there are no extras. We include all origination and delivery costs. The price you are quoted is the price you pay! Positive Media Promotions have a few product ranges that we specialise in which include printed beer mats, promotional travel card wallets or (oyster card holders), Trolley coins or tokens and reusable bags ie cotton shoppers etc. For these promotional items we have dedicated websites such as Beer Mats, Travel Wallets, Trolley Coins and Cotton Shoppers and Other Cotton Items and of course our Promotional Travel Wallets site. If you have a specific budget to spend on branded merchandising give us a call and we'll help you pick out the best products to help you. Our products can be used anywhere, promotional items can be used at trade shows, promotional stands or even just in the office like we do. We have such a variety of items it is always possible to find something that you can use. Call us today on 0800 0842424. The first promotional product most businesses start with are promotional pens. This is because we use pens every day and they are very cost effective. We have a large range of pens and writing instruments. 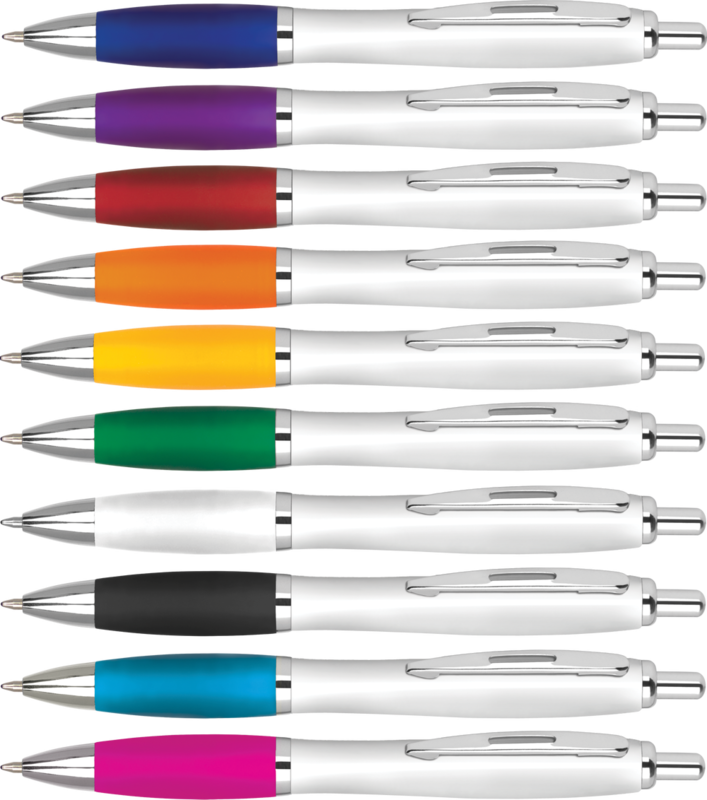 We can print from 1 colour to full colour and can even engrave selected pens. If you haven’t already go your own promotional pens now is the time check out our most popular branded pen the contour extra. 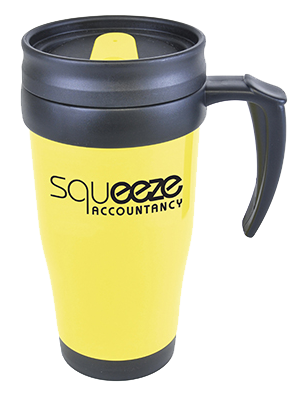 If there is one promotional product that most businesses have on their desk all day it would be a branded mug. The ROI of a promotional mug is one of the highest as it is a item that gets used daily and improves brand recognition for the advertiser. Even if your company get mugs for your staff to use they can help promote your brand from within and bring the team together. Memory prices have come down over the last few years which has made promotional usb sticks even more popular. They are one item that is hardly ever thrown away because of how useful they are. USB flash drives have a high perceived cost and thus are a promotional gift that is always well received. At Positive Media Promotions we have always promoted the use of reusable bags and thus launched our dedicated site cottonshopers.co.uk. We have supplied 100,000’s of printed cotton and jute bags over the years. Like the rest of our top five promotional products they are products which are very usable and have a long lifespan to promote your brand over and over again. We are members of the BPMA (British Promotional Merchandise Association) and they complete research every year on how promotional products have a place in the marketing mix. Some of the key facts from their latest survey are: It's not just the traditional promotional product types being purchased - over two thirds are purchasing electronic goods. From the people asked the most popular products that they purchased are 91% Pens, 66% Bags, 66% Electronics, 62% Mugs, 61% Clothing, 10% Notepads Over 70% of the marketers spoken to are using promotional products as brand awareness tool. In the eyes of marketers, a quality promotional product that is memorable is the key to success Quality 81%, Memorable 71%, Relevance 69%, Usefulness 65%, Long desk life 31% At Positive Media Promotions we pride ourselves at offering quality products at a competitive price. We want to make your campaign to have the desired impact to your target market and will do our best to make sure that you have a pleasant experience all the way through from order to receiving delivery of your products.